Any woman of Indian origin (regardless of her place of birth) between the ages of 17 and 27, inclusive, is eligible to participate. The contestant must be a resident of New York (living in the state for a minimum of six months). Appropriate documention regarding the age and residency status of the contestant must be submitted in order to meet the eligibility requirements. The contestant must behave in a manner befitting the title of Mrs. India New York. The IFC is NOT RESPONSIBLE for the contestant or any of her personal belongings. The IFC is only responsible for the meals for the contestants on the day of the pageant. 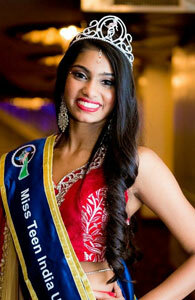 The IFC will conduct the New York Regional Contest and will provide one or more winners to the Mrs. India USA Pageant. The regional contest will consist of four segments (a) Indian Dress, (b) Evening Gown, (c) Talent and (d) Question and Answer. The IFC , in its sole discretion, retains the right to alter the format. The IFC may also give franchise to a reputable individual/organiztion to conduct Mrs. India New York. Judges will be selected for the Mrs. India New York by the IFC. They will be eminent respected members of the Indian, American and International Community. The IFC reserves the right to appoint all such judges. THE DECISION OF THE JUDGES, ONCE TABULATED, IS FINAL. THE IFC BEARS NO RESPONSIBILITY FOR THE DECISIONS OF THE JUDGES. Past Mrs. India New York winners have received round-trip tickets from New York to India, an expense paid trip to participate in Mrs. India USA plus various gifts (i.e. ,jewelry, watches, electronic items, gifts certificates, screen tests, picture portfolio, modelling scholarships and cash). The foregoing rules are subject to change by the IFC. All decisions regarding the eligibility of the contestant and the conduct of the Mrs. India New York, in general, are subject to the ultimate approval of the IFC.